Great news! I finally got my ancestry DNA results back! What did they tell me? Well, this test breaks down your ancestry by genetics, not by the country borders you usually refer to when discussing your heritage. The countries that I was told I am from all fell into the groups that tested positive- except Great Britain. This was surprising because we know that my great great grandmother lived there, but just because you live somewhere doesn’t mean you are a genetic match for that region (after all, my test didn’t say 100% New Yorker). This test did cover my Lithuanian, Polish, Russian, German, Irish and Dutch backgrounds. This week, I decided to explore some popular Dutch foods. When I was in Amsterdam a few years ago I remember seeing a lot of restaurants that were from other cultures. It seems as though Amsterdam is a popular place for immigrants to settle and open a business. I can recall eating at an Australian restaurant, an Italian café, and an Irish pub. My favorite, though, had to be the waffle shop. Waffle shops are everywhere in Amsterdam, and you can get almost anything you want on your waffle. I had a waffle smothered in Nutella ice cream, different fruits, whipped cream, and various other toppings. I had another that was STUFFED with cream cheese and lox. So insanely good! I tried their “stroopwafle,” which is two thin waffle-like cookies that have caramel syrup in between them. They were good but way too sweet for me. What I really wish that I knew about while I was there was Bitterballen. Probably the most comforting thing I’ve ever tried. I recently saw my friend post a picture of Bitterballen when he was in Amsterdam and I had to learn more about it. He recommended making it for my dish inspired by the Netherlands, and so I did. Having never eaten this before, I will say that I was not expecting it to be very different from a meatball. Bitterballen looks like a meatball and has a breadcrumb or panko coating on the outside that’s fried. The taste is what really wowed me, though. It’s creamy, crispy, soft, and just comforting all at the same time. As I tasted the filling, I thought of using it in the future to make a pot pie or casserole. I couldn’t stop eating it as I was making this dish! While researching, I found that Bitterballen is most frequently made with beef. Since I try to keep things lighter, I used 94% lean ground turkey instead. They are also traditionally fried in several inches of oil. I haven’t fried something in years and can’t imagine starting now, so I decided to use a thin coat of oil in a skillet just to get the outside of the balls crisped up. After they became golden, I continued to heat them by baking them. By choosing to cook them this way, you can cut down the amount of fat drastically. I also made this dish a little healthier by using whole wheat flour instead of all-purpose flour. I discovered that the secret to this delicious treat is to make a roux. Believe it or not, many of the comfort foods you love to order at places probably start with a roux. For example, pretty much any sort of soups or stews (especially in New Orleans), macaroni and cheese, and fondue. 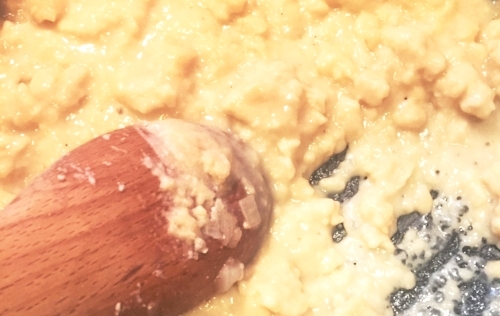 You can make a roux by mixing equal parts of fat and flour in a hot skillet. The trick is to constantly stir and add the flour slowly. Several years ago, I took a cooking class in New Orleans with my mom and sister. They taught us that you should drink a beer while stirring your roux. By the time you finish, the roux should be a dark enough color to add the right flavors and consistency in your dish. I chose to be alcohol-free while cooking this, so I just waited until it became a golden brown color. 1) Brown the ground turkey in a skillet sprayed with cooking oil. Once the turkey begins to brown, add the onions, pumpkin pie spice, cinnamon, garlic, salt, and pepper. Cook until the turkey is no longer pink, then set aside. 2) In a separate skillet, begin to make your roux; Put the butter in the skillet and stir until melted. Slowly add 1/2 cup of the flour while mixing constantly, continuing to mix until your roux becomes thick. You can add water as needed to reach desired consistency (I added about 1/2 cup of water). You want your roux to be thick, but not so thick that it just sticks to the spoon and looks like play dough. It should cover the base of the skillet. 3) Add the turkey mixture to your roux along with the cup of beef broth and parsley. Let the mixture simmer and mix occasionally to prevent it from sticking to the sides, seasoning with salt and pepper as needed. 4) Once the mixture has reduced (it should look thick like a can of condensed soup), put it in a bowl and set aside to cool. After about 10 minutes, put it in the fridge to help it cool faster, and let it sit for another 20 minutes or longer. 5) Preheat the oven to 350 degrees, and set up two baking sheets that have a sheet of foil sprayed with oil on top. 6) Set up a bowl with a beaten egg and the 1/4 cup of milk, then season with salt and pepper. 7) Sprinkle 1/4 cup flour or more onto a plate and set up another plate or bowl with the panko breadcrumbs. 8) Heat 1 tbsp of oil in a pan or spray with cooking spray. 9) Take the dough mixture out of the fridge. Form a small ball with the dough, roll it in the flour, dunk it in the egg and milk mixture so it is covered, then roll it in the panko. 10) Put the ball in the hot skillet and turn occasionally to brown the outsides and get it nice and crispy. Continue this until you run out of space in the skillet. As the balls start to look brown, take them off of the skillet and put them onto the foil-lined baking sheets. 11) When you fill a sheet, pop it in the oven for 10 minutes, then turn them and put them back in the oven for another 5-10 minutes. The filling in these will be really hot so make sure you let them cool a little before serving. Plate, sprinkle fresh parsley on top, and serve! I am so glad I found out about these. I can easily see this being a regular recipe. These little heavenly Bitterballen would be perfect to bring to a party or serve as an appetizer. I am even thinking about other ways that I can use this incredible filling in my cooking. They were very easy to make and did not require much skill at all. I think the hardest part was actually forming the balls of dough because the filling is so sticky. Other than that, they took very little effort. If you want to impress your friends, bitterballen is the recipe to make!